The Statement made by Foreign Minister Tilak Marapana at the 37th Session of the UN Human Rights Council, Geneva on March 21, 2018. I am joined today by my Cabinet colleagues, the Minister of Special Assignments, Dr. Sarath Amunugama, and the Minister of Provincial Councils and Local Government, Faiszer Musthapha. My colleagues and I represent the two main political parties that form the coalition government. We are here before this Council together in unison, to speak with one voice, demonstrating the Government’s firm commitment to the advancement of reconciliation, the rule of law, good governance, human rights, justice, equality, and dignity for all our citizens, based on the 100 Day Programme on which President Maithripala Sirisena was elected in January 2015. We would like to express our sincere appreciation to the High Commissioner, the Deputy High Commissioner and the staff of the OHCHR for their consistent and constructive engagement with Sri Lanka, the invaluable technical support extended to us, and for their support and encouragement at all times. We do not consider the reconciliation process in our country as a box-ticking exercise. We are deeply committed to uphold the rule of law and to ensure the equal protection of the law to all individuals without discrimination as guaranteed under the Constitution of Sri Lanka. We also recognize that we owe our citizens equitable socio-economic development, which can only become possible through the establishment of durable peace and reconciliation. We are making every effort, therefore, Mr. President, despite the socio-political and economic constraints and challenges that we face, to realize our vision of a reconciled, peaceful, stable and prosperous Sri Lanka for all our citizens. In this context, and in response to the High Commissioner’s observations on progress made by Sri Lanka thus far, we wish to place on record our most important achievements since Sri Lanka last addressed this Council at the 34th Session on February 28, 2017. Much progress has been made throughout the course of last year as well as previously, demonstrating Sri Lanka’s firm commitment, willingness and ability to advancing truth, justice, reparations and guarantees of non-recurrence of conflict. As you are aware, the action by the Sri Lankan security forces during the conflict was against a group designated as a terrorist group by many countries, and not against any community in our country. The operations of the terrorist group, which for the first time in recent history have deliberately targeted innocent civilians have now been adopted by terrorist groups all over the world. All communities in Sri Lanka were united against terrorism in my country, and now that terrorism has been defeated, all communities today work in unison towards reconciliation and economic progress of the country. A comprehensive list that demonstrates the progress Sri Lanka has made in the advancement and protection of human rights, reconciliation, and good governance since January 2015 to-date has been distributed to all members of the Council. I will therefore set out some of the most important steps we have taken. In September 2017, the President formally operationalized the Permanent Office on Missing Persons, pursuant to the enactment of the Office on Missing Persons Act in August 2016, as amended in July 2017. On the recommendations made by the Constitutional Council, the President appointed the Chairperson and members of the Office on February 28, 2018. At a meeting with the Chairperson and members on February 28, the President assured them of the fullest support of the Government to ensure the effective functioning of the Office. Sri Lanka Rupees 1.4 billion (approximately 9 million USD) has been allocated in the National Budget for 2018, for this Office. The members selected, in accordance with the provisions of the Act, represent the pluralistic society of Sri Lanka. The appointed members are currently receiving training and studying practices of similar mechanisms elsewhere which will help them to discharge their mandate effectively. The Cabinet of Ministers, on March 6, 2018, approved the formulation of legislation by the Legal Draftsman, for the establishment of an Office for Reparations. Once the draft legislation with translations into local languages is finalised, the draft Bill will be presented to parliament. Legislation to give effect to the International Convention for the Protection of All Persons from Enforced Disappearance was passed by the Parliament on March 7. Demonstrating our firm commitment to reconciliation and ensuring non-recurrence, Sri Lanka acceded to the Ottawa and Oslo Conventions (Convention on the Prohibition of the Use, Stockpiling, Production and Transfer of Anti-personnel Mines and on their Destruction and the Convention on Cluster Munitions) on December 13, 2017 and March 1, 2018 respectively, and also received the Special Envoy on the Ottawa Convention earlier this month. Sri Lanka participated in reviews of its periodic reports by the Committee for the Elimination of Discrimination against Women (CEDAW) in February 2017, the Committee on Economic, Social and Cultural Rights (CESCR) in June 2017, and the Committee on the Rights of the Child (CRC) in January 2018. The Prevention of Terrorism Act is proposed to be repealed and replaced with a counter-terrorism law that conforms to human rights safeguards and other international standards. In terms of our Constitution and legal processes, this legislation will be finalized after due parliamentary procedures are followed. Amendments were brought to the Local Authorities Election Act and the Provincial Councils Election Act, ensuring a quota to elect female representatives to the Local Government and Provincial Councils, which are important grass-root-level decision-making bodies. At the recently concluded Local Government Elections held on February 10, 2018, the legislation ensuring 25% quota for women was implemented ensuring the election of a record number of women to local government bodies for the first time. Sri Lanka participated in the 3rd cycle of the Universal Periodic Review in November 2017, and its report was adopted on March 19. As a nation we are pained by the recent incidents in a few areas of Sri Lanka targeting members of the Muslim community who represent an integral part of the pluralistic society of Sri Lanka. Such acts which go against our shared vision of a Sri Lanka where equal rights and rule of law are guaranteed for all, have no place in a democratic, pluralistic society. The Government has taken swift action against perpetrators of these incidents and is investigating any lapses that may have taken place. Stringent measures will be initiated to ensure non-recurrence. A victim compensation programme has already commenced. We have reason to believe that certain interested parties were behind this, to tarnish our image at a time when this Council is in session. Following investigations, as it was discovered that social media and messaging platforms were being used not only to incite and spread hate and false messages but also to organise attacks, the Government was compelled to impose temporary restrictions on the use of social media. All these restrictions have now been lifted. The Government as a result of this experience has entered into active engagement with social media operators, to work with them on the prevention of hate speech. The emergency regulations which the Government was compelled to impose on March 6, 2018 as a measure to protect communities, were rescinded on March 17, 2018. The reconciliation and development agenda cannot be successfully achieved by Government working alone. The participation of political parties, civil society, academia, the business community, the media as well as the international community are essential for this important national endeavour. We would like to stress with sincerity and conviction that we will not be deterred by anyone in fulfilling the undertakings given by us to our people, which will lead to building a peaceful, stable, reconciled and prosperous Sri Lanka for all our citizens. The legacy of conflict in Sri Lanka is heavy, and it permeates our society to this day. Extremists constantly strive to take advantage of this situation to achieve political gain. This realization only makes us even more determined to ensure that we never return to the violent days of the past. It is our intention to ensure the fulfilment of our commitments to all our people and bring closure to a sad and disturbing period of our recent history. 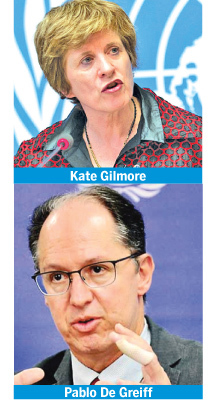 Kate Gilmore, United Nations Deputy High Commissioner for Human Rights, said there were seven briefings, updates and reports of the Secretary-General and the High Commissioner, submitted under item 2 concerning Burundi, Sri Lanka, Guatemala, Honduras, Colombia, Cyprus and Iran. Concerning Burundi, in September 2017 the Council had adopted resolution 36/2 requesting the deployment of three experts to collect information concerning human rights violations in cooperation with the Burundian authorities and relevant stakeholders. The Office was finalizing the recruitment of the three experts and would update the Council on progress in the June session. Nonetheless, the situation in Burundi was of grave concern. Security forces had been employed in comprehensive human rights violations. The Government’s plan to revise the Constitution had generated a host of human rights concerns. Since December 2017 and the start of the campaign for a referendum to amend the Constitution, a crackdown had been seen on civil society and political opposition in 15 out of 18 provinces. Government officials had issued statements warning citizens not to oppose the referendum. A climate of fear and violence had been exacerbated and during the voter registration period, reports of intimidation had been reported. The Government of Burundi had suspended its cooperation with the Office of the High Commissioner since October 2016. Presenting the report on Guatemala, Ms. Gilmore said that the efforts of the Office of the Attorney-General, which had been working with the support of the International Commission against Impunity in Guatemala, were commended, as well as the efforts of the Human Rights Ombudsman. A selection process for a new Attorney-General was ongoing. Human rights defenders, journalists and members of the judiciary were performing their duties admirably but they had also been targeted by smear campaigns. Guatemala was at a crossroads and the Government was encouraged to keep pursuing the quest for equality, truth and justice. Ms. Gilmore thanked the Government of Honduras for their cooperation with the Office of the High Commissioner. Following last year’s disputed outcome of presidential elections and peaceful protests, the security forces had used excessive force, resulting in people being killed and injured. Continued attacks had been registered against journalists and human rights defenders. Steps that had been taken to strengthen the investigative capacity of the office of the Special Prosecutor on femicide were welcomed. With more than half of the people living in poverty, non-discrimination needed to be at the core of envisaged reforms in Honduras. Introducing the report on Colombia, Ms. Gilmore said that the Peace Agreement between the Government and the Revolutionary Armed Forces of Colombia—People's Army had entrusted the Office of the High Commissioner in Colombia to monitor and assist in the implementation of several aspects of the Agreement and to report to the Council. In January, there had been a return of hostilities between the Government and the National Liberation Army. Armed groups and criminal organisations had entered areas formerly under the influence of the Revolutionary Armed Forces of Colombia—People's Army, seeking to control illicit economies. A major concern was the increase in killings of human rights defenders, as 84 human rights defenders had been killed in 2017. Accelerating the reintegration of the Revolutionary Armed Forces of Colombia—People's Army was essential, as 36 former members had been killed in 2017. Presidential elections would take place in May so the Council was encouraged to follow closely the situation. Ms. Gilmore said the report on Cyprus provided an overview for the period between December 1, 2016 and November 30, 2017. The persistent division of the island continued to hinder the full enjoyment of human rights. Positive developments were acknowledged related to bi-communal initiatives and confidence-building measures, and the search for missing persons continued to progress, albeit slowly. The inter-religious dialogue was sustained. Concerning Iran, the Secretary-General had expressed alarm at the continuing high number of executions. The December 2017 protests had led to at least 22 deaths and thousands had been arrested. The persistent pattern of intimidation, arrest and prosecution of human rights defenders was of deep concern. There had been encouraging developments relating to the employment of women and girls but the prevalence of child marriage had remained. The Secretary-General welcomed the improved cooperation between the Government and the treaty bodies. Moving to the written update on progress in promoting reconciliation, accountability and human rights in Sri Lanka between March 2017 and January 2018, Ms. Gilmore said the Government’s constructive engagement with the Office of the High Commissioner and the human rights mechanisms was welcomed. Accession to the Optional Protocol to the Convention against Torture was noted. However, slow progress was noted in establishing transitional justice mechanisms and it was doubtful that the transitional justice agenda would be implemented before the Council’s next report in March 2019. The commissioners of the Office of Missing Persons were appointed 20 months after the adoption of the legislation and there was insufficient progress in returning land occupied by the military and no demonstrated willingness to address impunity. Multiple incidents of inter-communal violence and attacks against minorities had been observed last year. Ms. Gilomore concluded by noting that over several years now, the Special Rapporteur on the promotion of truth, justice, reparation and guarantees of non-recurrence, Pablo de Greiff, had engaged closely with Sri Lanka. As he would soon conclude his mandate, the Council would now benefit from his insights. Pablo De Greiff, Special Rapporteur on the Promotion of Truth, Justice, Reparation and Guarantees of Non-Recurrence, said that since early 2015 he had had a continuous and thorough engagement with Sri Lanka in the form of four advisory visits, which had culminated at the end of 2017 with a fifth and fully-fledged country visit. He stressed the urgency of the matter in light of the most recent attacks against members of the Muslim community. In 2015, he had highlighted the following issues as needing immediate attention: clarifying the fate of the disappeared and missing persons; addressing land issues; refraining from arbitrary detentions, particularly on the basis of outdated anti-terrorist legislation followed by protracted trials lasting years; and putting an end to continuing forms of harassment, violence and unjustified surveillance of civil society and victims. In 2015, Mr. de Grieff said he had also argued and advocated for the planning and adoption of a comprehensive transitional justice policy, including its four main pillars, namely truth, criminal justice, reparation, and guarantees of non-recurrence. The appointment of the Commissioners for the Office of Missing Persons was a sign of hope. Mr. de Grieff called on all actors to invest in the Office of Missing Persons, and allow it to work in an effective and independent manner, with sufficient financial and human resources, the participation of victims and civil society, and with effective protection systems and support services for victims and witnesses. However, the Office of Missing Persons was only the beginning. Sri Lanka was a country in which all communities had victims, generated by cycles of violence that recurred approximately every 10 years, confirming that violations that had not been redressed significantly increased the likelihood of repeated violence. In a country in which transitional justice had become politicized, it was important to recall that there were many examples of intra-communal violence, such as the insurrection of 1971, the 1987-89 violence, and LTTE violence against members of the Tamil community. All those victims had a right to truth, justice and reparations, and the whole society had a right to non-recurrence, for which an effective end to impunity was necessary. Sri Lanka needed decisive and courageous action. It needed a constitution which made everyone feel that their equal rights were acknowledged, and that found a way to express their fundamental values and interests. History did not need to be fate; the cycles of violence could indeed be broken.